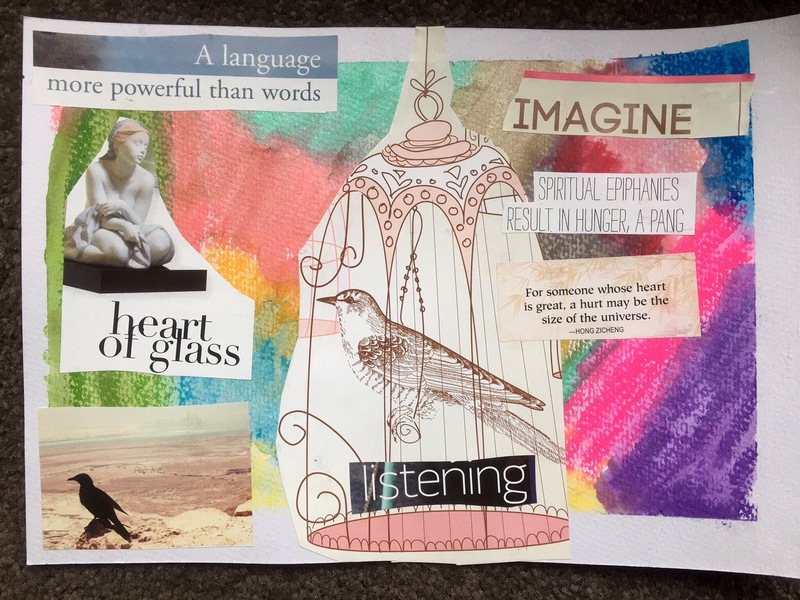 Day 21 Soul Smashing.. 30 day Journal Project. Obviously I have not done this in 30 continuous days lol. “It’s hard to go. It’s scary and lonely… and half the time you’ll be wondering why the hell you’re in Cincinnati or Austin or North Dakota or Mongolia or wherever your melodious little finger-plucking heinie takes you. There will be boondoggles and discombobulated days, freaked-out nights and metaphorical flat tires. But it will be soul-smashingly beautiful..
Oh absolutely. I mean it gives me a story to tell unlike anyone else’s stories. I am just going to share this little moment I had recently. In this book it suggests doing morning pages. 3 pages of writing anything at all just to get it on the page and out of you. Apparently this is supposed to help unclog our creative flow. Even if all you can say is ‘I cannot write today I have nothing to say.’ over and over. Getting yourself into a writing ritual and it isn’t meant to be pondered and it’s just for your own eyes. I have done Morning pages for two days now. I found myself writing about the difficulties I have had with other people who have gossiped about me and how it has possibly ruined my reputation or clouded people’s opinions of me. I will not quote myself here because it’s personal and I have never learned to write in such a way people cannot see right through me. I am not about ruining anyone else either. Of course I am not 100% about what things these tongues are saying about me. It is just that a lot of people have been indifferent towards me for quite some time and if I put two and two together I suspect that this is what has happened. I have had fall outs with a few people and I have spoken about such here on my blog and on social media. Never to out or gossip about people but to cope with it, survive it. Anyway I was sharing about this today in my Morning Pages and something else completely unrelated came into my path almost immediately after. It has amazed me and indeed smashes my soul and is perfect for this prompt for Day 21 of 30 days. I randomly picked up a book of Sonnets by William Shakespeare and was flicking through it. 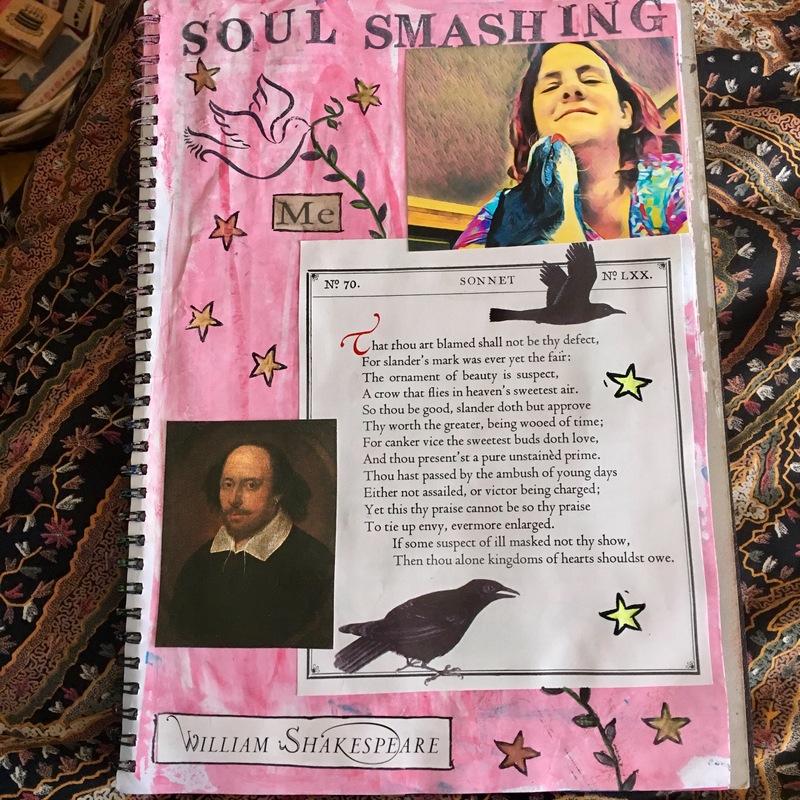 The thought bouncing around inside my head was that possibly reading one sonnet a day could help my creative inspiration or even just that I could see if the book was worth keeping. I have a very bad habit of collecting books and art supplies and ‘gulp’ not always using them. I have been slowly weeding out one thing daily and today I wanted to see if this one was worth keeping for reading, cutting up, or getting rid of. Yes I do cut up good books but most of them I pick up second hand at thrift stores so although it is still strange to cut up books I feel more justified doing so with old/used books. At first glance I thought why am I bothering with such writing. Old style poetry/sonnets? 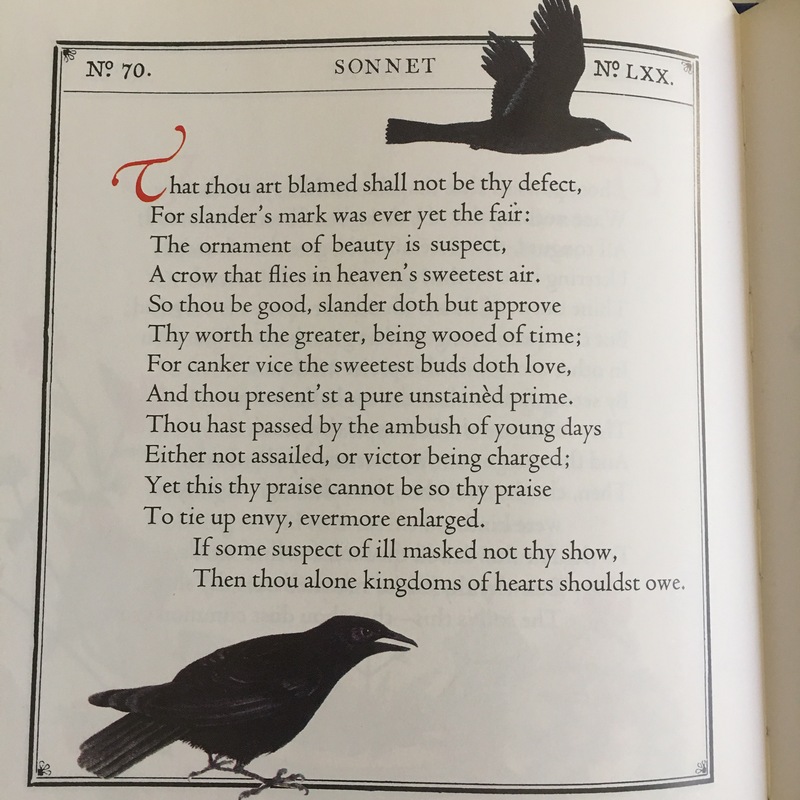 Kept browsing looking for pics to cut out and keep and I was almost going to just ditch it when I found a sonnet with crow pics that caught my eye. I love crows. I see them all the time when I walk and I don’t know they seem to watch over me almost. Keep me company because they are simply always there.. I identify with them. They are seen as a bad omen by some yet I see great goodness in them. Birds created by God and HE takes care of them. Many scriptures about God caring for birds. So I gave the sonnet No.70 my undivided attention. I can thank the recent Mental health and literature University course I’ve done for teaching me the value and strength of writing like this. To look deeper into it. Not expecting every word to make sense but to read out loud or ponder it and stay with it’s words and meanings and identify with the heart of the poet/author. I even went on-line to see if I could find the actual poets meaning of it. Lo and behold it echoed much the same as my feelings and thoughts I had written in my Morning pages, of course not in so eloquent of words but woah!!! Just like that a bridge appears in my life. A bridge that connects me here in the future to the past, via my own frustrations and struggles and links me to what William Shakespeare for his own reasons wrote so very long ago. It is at this point I’m blown away with the unique timing of it’s appearing. The similarity spanning ages and my soul just sighs. I can’t help acknowledging God immediately. I just sit and let the moment sink in. I just see so clearly as I study the words in the sonnet that the similarities found show something much deeper and far more reaching is at work. I think my jumbled and mis-matched life just makes it that much more of a miracle that this sort of connection happens. It kind of says to me something greater is working in and through us all which does link past, present and future. I AM going to cut this sonnet out and use it in an art journal page. How mysterious that a sonnet penned so very long ago connects with me in 2017 and so beautifully describes to me similar feelings. It encourages me that all is not lost. Using Crows as well none the less. Strengthening me that such things said about oneself shall not be to one’s defect! One’s worth shown to be greater simply because tongues have indeed risen against. Such moments of connection do indeed happen so often in my creative life that I swoon over them and it is why I naturally want to be arty. Heart is overjoyed and my whole outlook is lighter. I feel a huge overriding sense of a past and present oneness of Spirit and at least at this moment can see it all melds together. That no matter what happens and how strange it might seem all peoples’ throughout time have experienced such. Identifying a similarity, a common thread and it comforts me. I am helped by these words in this sonnet which I will copy a pic from the book here below.. It is extraordinary. I think to myself. For something as powerful as a connection like this to happen in a small tiny random moment in my life. How much more is happening out there to all of us that maybe we are not yet aware of but it IS still out there working beautifully and hopefully my sharing might make someone else notice soul smashing moments too. Gives one incredible fortitude to think of the similarity of Spirit connecting us all. Three soul questions I asked myself. Written on three pieces of paper. Turned over and shuffled. Than I used colours on those papers. Not knowing what question was on which paper. Than chose collage pieces.. Words and pictures on each as to how I was currently feeling. What images drew me at the moment. I assembled each one and turned over. This is my thoughts on each.. Amazing experience to do. 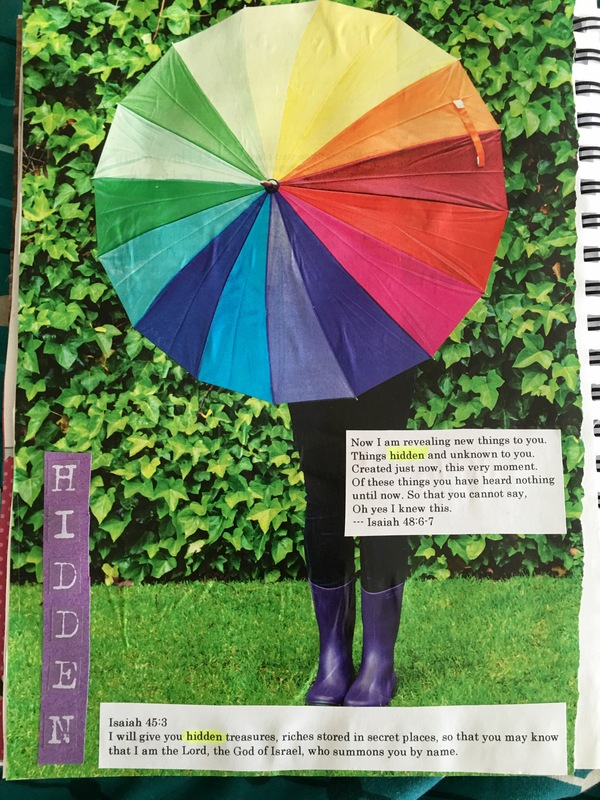 Found through the book “The Artist’s Rule” Christine Valters Paintner..
What does God/HE want me to learn in the midst of where I am currently, how I am currently? Gold centre.. I have learnt my value in Him. God doesn’t make junk. I’ve found that out through HIM alone and being so alone because of disability and circumstances. The gold was in the middle.. But all around the gold was black.. Hard pressed on all sides. Some yellow in the black because I’ve learnt things.. Important things in hard times. When you blend the colours with water. Gelatos. Gold pretty much stayed pure in the midst of the black. So even though the darkness has tried to shut me down. It’s only made me more intense faith wise and also helped me find my core strength. I look up. It’s not about anything else but HIM really.. Although the person I used to represent myself in this is a child. I am central in my story. I do relate to being childlike. That’s ok. And even though I’m often alone and seems like it’s just about me. It’s actually all about HIM. That’s how HE does HIS thing. It’s an honour. I realise it’s an honour. My Spirit is HOLY. Because of HIM. Love. I know I’m loved. And it definitely doesn’t mean I’m perfected in this whole experience on the outside yet.. In fact my imperfections I must embrace as part of it. Artist. Is just simply telling it in my own way. Look up.. Use it all. Focus on HIM. On love. On Spirit. 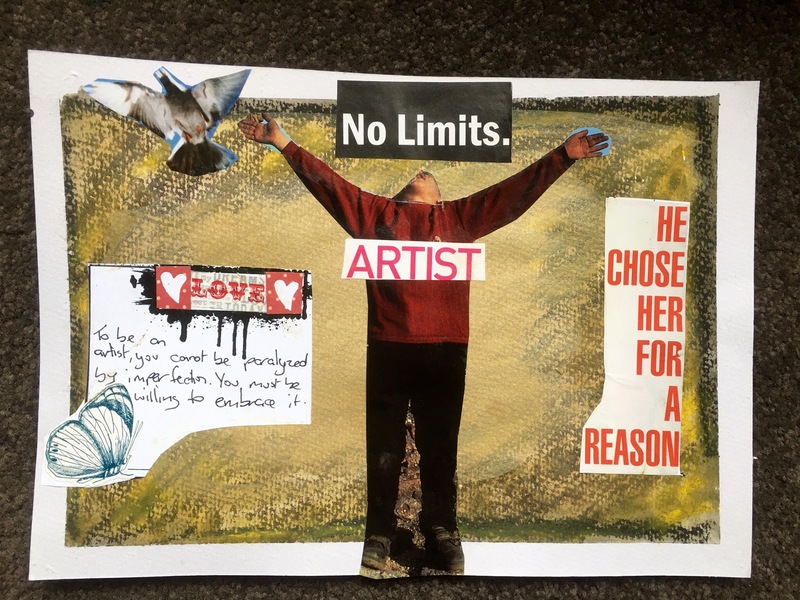 On limitless spirit. As I am.. Where I am. Opportunities endless. 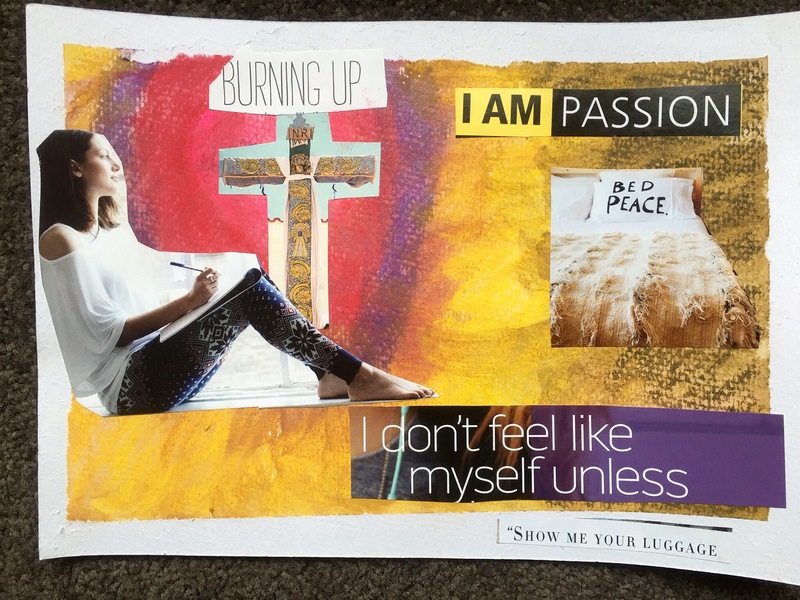 What is my Spirit desiring at the moment? What is on my heart? Colour. I want to see beauty I look for it. Open to it all. Variety. Expression that bypasses words. I need to be creative to live this life. . I want to be more honest. Seek truth. Transparency. Of the heart. Freedom. Imagination. Even though I feel majorly shut down in many ways. I still have hope. It’s amazing that the pictures of me I found were large. It’s as if God is saying. It’s ok. How things are and how they seem. Supposed to be that way. It’s how HE uses me. Emotions play a huge part as does the heart. Spiritual longing creates stronger desires. It’s like the more I learn the more I want to learn. More I feel hard pressed. Brings forth beauty. Spills out. Makes me seek HIM more. From my great need I produce life and art and bring forth from that. In simple ways but powerful ways. Desiring freedom. Revealing soul. Going within. Using my spirit and expression. To communicate freely. How can I use rejection to work for me and not against me? I drew a heart but not central. Colours that radiated out from that. It looks now as if it’s a flower. Heart are seeds and the paper and gelatos made a pattern that further made it look like a flower. Like petals around it. What was done on the cross central. There’s freedom there. Forgiveness and restoration. Hope. Peace. Love. All that I could want found there and flows from there. A burning heart within the result. Despite the things done to me and my heart. I need to share and that hasn’t stopped. Seeds only fall when a flower dies. But more flowers come from it. I need peace.. Central to who I am. I will always choose peace over everything else. It’s how I live through the hard times. The assaults on my soul.. I can’t bottle it. I have to tell it. Or write it or share it. It’s who I am at the core. Yellow seems good and holy. And what doesn’t destroy us will shine and bring forth beauty. But even if our very hearts wither and die the seeds within will always do their thing! How artists speak from beyond the grave! Letting myself bloom and my spirit shine and my passion break free. Being myself despite it all. See that hard things are not me. But rather what has happened to me. Makes me bring forth what is always and already inside. It’s the vehicle for bringing forth what makes me bloom and bring forth my harvest. Even if I was completely destroyed from it. You crush a flower the perfume escapes. I am reading through a book called “The Artist’s Rule” where it gave me this scripture and I am contemplating on it and learning from what stands out to me at this moment. What speaks to me. What is relevant about it to my current life. Hidden is the word that stands out to me today. It’s like spiritually, physically, emotionally even, I’ve been hidden. Who had to hide from Saul. Saul had a jealous spirit and persecuted David. He tried to destroy him. Doesn’t Satan seek to steal, kill and destroy? Spirits of evil still work through people. So I get a sense it’s wise and understandable to escape from what appears to be seeking to destroy us. The hidden part. There have been unseen forces over the years that have come against me through people and personal situations that have contributed to where I am and how I am today. Though I have been most frustrated with the ‘unseen’ part of it. The hiding part isn’t as obvious to many. Like many are blind and deaf to what has happened to me. Or it seems it doesn’t matter. They can really only see the results of what has happened to me. I shared openly recently about the physical struggles I’ve faced and how that has shaped me. But it’s harder I think to define the struggles with people. Very real, different people at different times but similarities in them all as to how it affects me..But also its about more than just me. Where the bible names people and situations openly where there has been persecution.. the Christian way seems to be that we hide things and don’t speak publicly about it. Heaven forbid we name people. I don’t mean shaming, unkindness etc I mean speaking truthfully and not being afraid so that we can all find healing and move forward.. Truth sets free. Forgive and move on is the Christian way. Turn the other cheek thing which is ok if it stops. Where I have struggled with the ‘hide it what has happened to me’ kind of thing is where it has been ongoing and subtle. Slowly slowly chipping away at me till there was less and less of my confidence. So that when and if I react it comes back on me lol instead of the one doing it.. Unmentionable and extremely cruel like a person suffering but nobody notices and that in itself destroys you the anonymity of it.. It continues on destroying as it was sent to do. Now ok for believers in God it’s spiritual not personal but that shouldn’t mean we just lie down and let people walk all over us. This word hidden also speaks to me about being in a place where things are specifically revealed at such a time. That there is a greater reason. New information to be learnt. That’s been Gods way all along. When bad things happen, God uses it for good. I am encouraged that even David had to hide for a season or two or three… onwards till it was safe to re-enter the world normally.. All this time something evil was doing its best to shut him down.. When that word came up again today. It gives me hope. I can trust God when things are hidden. I am hidden. A reason for it and it’s ok. New things will be revealed. Treasures will come forth. By God who summons us personally!